Prominent & Leading Manufacturer from Ahmedabad, we offer crm software. Customer relationship management (CRM) focuses on your enterprise's number one priority—creating a satisfactory customer experience that will delight your current clients and help you acquire new ones more quickly. Sales365cloud India's game-changing technology and Customer Relationship Management cloud software addresses all your customer interface concerns, from sales and marketing to customer service, streamlining your enterprise and saving invaluable time and resources. At platform delivers state of the art CRM Software-as-a-Service virtually, bestowing your business with all the 21st-century speed and efficiency of the cloud computing revolution in India. Come join the cloud and transform your customer service with our cutting edge technology. Take our risk-free CRM trial now. 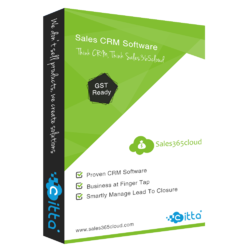 CRM custom software from Sales365cloud instantly updates your business processes, combining them with people and technology to reveal more about your customers and their behavior with deeper analysis and insight into critical sales and customer metrics. Packaging Details: - Point of sale systems simplifies the accounting process. - Unlike a cash register, a point of sale system often includes an overall inventory management system. - It is easy to look up past transactions. - You can use a point of sale system to create your own purchase orders, eliminating an extra step in the ordering process. - Modern workers are often more comfortable with a point of sale devices than old-fashioned cash registers. - Point of sale system peripherals barcode scanner facility makes transactions execution quick and save customers precious time. - Sell More Products - Buying selling Faster buying/selling procedure. - Compatible with all platforms.